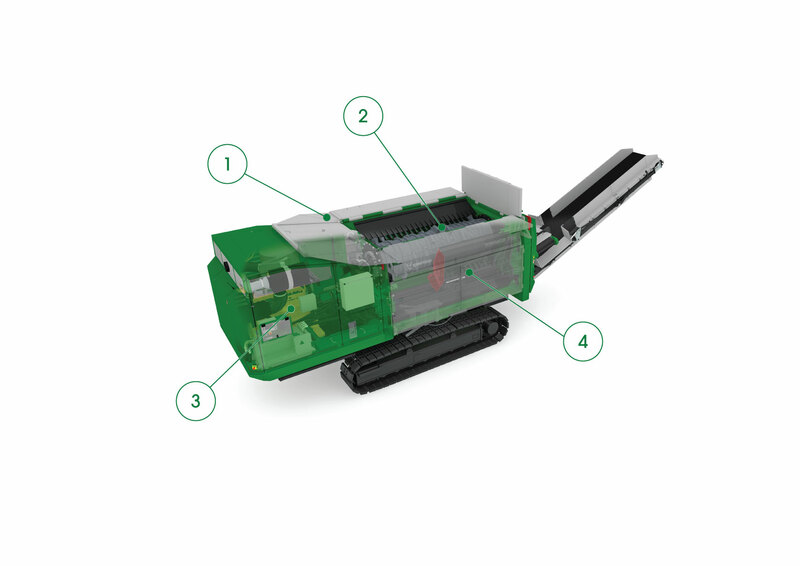 The Terminator is a low-speed, high-torque single-shaft industrial shredder designed to process nearly all types of difficult waste, including heavy C&D debris, bulky waste, white goods, mattresses, tires and municipal solid waste (MSW). This heavy duty shredding machine is powered by a modern Tier 4 Caterpillar® engine delivering up to 600 HP to the drum. The hydraulic drum drive with load dependent speed control, creates maximum shredding force, and can reverse at any time to prevent blockages, redistribute material or clean the drum. The continuous cutting gap adjustment allows for the precise setting of desired particle size. 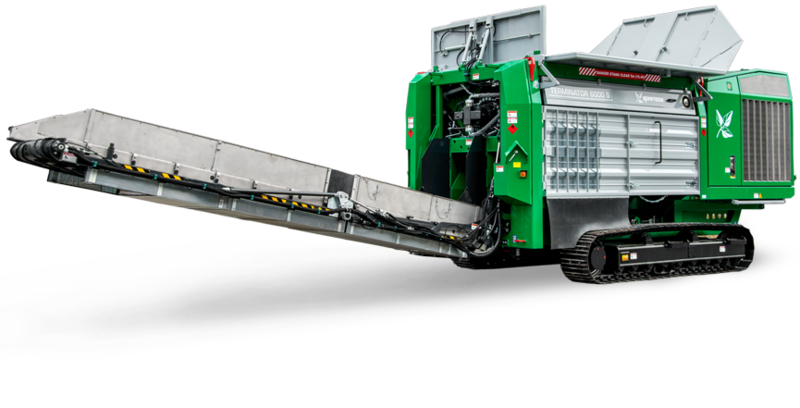 A remote control hopper with an 11-foot feed opening into one of the largest shredding units in the industry gets your waste materials shredded faster. Heavy duty rotating drum with overload protection and reversing function features robust teeth in spiral arrangement for maximum cutting and tearing while keeping shredding even. Achieve a variety of particle sizes with the adjustable cutting gap and counter comb, and swap shredding units to configure from coarse pre-shredding to defined shredding. Three Terminator models are available to choose from and are built for a variety of load sizes and waste types. We won't just sell you a machine. Instead, we focus on understanding your unique business challenges and then use our industry and product expertise to help guide you toward the right solutions to meet your needs. HAVE A QUESTION ABOUT THE TERMINATOR?